Martin Perry 16th November 2011 24th December 2015 Comments Off on Sports Psychology: Martin Johnson – The Best Ex-Player! 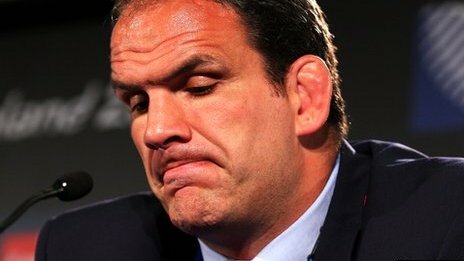 So Martin Johnson quits as England rugby coach. With a full review of England’s World Cup under-performance due, Johnson walked before he was inevitably pushed. But how did it come to this? How is it, that the only Englishman to lift the World Cup, should leave the international scene with his head bowed? It’s likely that his players will come out with the usual platitudes. That they let him down and how bad they feel. But it should never have come to this. Johnson gave his squad licence to act like men. He trusted them to behave, presuming that they had the mental and emotional self-discipline the he himself had in abundance. But they hadn’t. And when they crossed the line, he didn’t come down hard enough on them. He let standards drop. Players will always push to see what they can get away with. This England squad clearly felt that they could get away with plenty. They saw the coach as a soft touch, knowing that he trusted them. Maybe Johnson felt that because he knew instinctively as a player how to behave on and off the field, his players would too. But they didn’t. His job as a coach was to educate and teach them the disciplines and mental toughness that was in his rugby dna. But because it came naturally to him, he probably didn’t know how to transfer it. This is the syndrome that means that not all great players are great managers. The lesson is simple. Dont start your coaching career at the top. Begin away from the spotlight. Make mistakes far removed the media glare and inquisition. The head coach of England should be the best coach in England. Not the best ex-player!